ავტორი: Perkins B., Hammer J.V., Reid J.D. 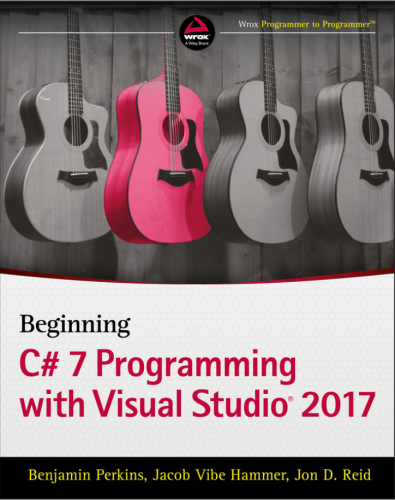 Easily get started programming using the ultra-versatile C# 7 and Visual Studio 2017 Beginning C# 7 Programming with Visual Studio 2017 is the beginner’s ultimate guide to the world’s most popular programming language. Whether you’re new to programming entirely, or just new to C#, there has never been a better time to get started. The new C# 7 and Visual Studio 2017 updates feature a number of new tools and features that streamline the workflow, simplify the code, and make it easier than ever to build high-quality apps. This book walks you through everything you need to know, starting from the very basics, to have you programming in no time. You’ll learn about variables, flow control, and object oriented programming, then move into Web and Windows programming as well as databases and XML. The companion website provides downloadable code examples, and practical Try It Out sections provide explicit, step-by-step instructions for writing your own useful, customizable code.